AUGUSTA, Maine — Gov. Paul LePage lashed out at Democrats during a long and wide-ranging news conference Friday at the Blaine House, calling them “repugnant,” “disgraceful” and “children” for delaying a committee vote Thursday on LePage’s latest nominee for the Maine Public Utilities Commission. On Thursday, the Legislature’s Energy, Utilities and Technology Committee voted along party lines to table LePage’s nomination of Tennessee economist Bruce Williamson to the PUC. LePage then took aim at House Speaker Mark Eves, D-North Berwick, and Senate Minority Leader Justin Alfond, D-Portland. Democratic House Majority Leader Jeff McCabe of Skowhegan fired back at LePage, calling him “angry,” “unglued” and “unhinged” and saying Friday’s news conference was more evidence of his combative and one-sided leadership style. While Democrats justified their tabling vote on Williamson’s nomination by arguing that such an important decision be made carefully, Republicans say Democrats are using the nomination to curry favor with advocacy groups that could help apply public pressure on Republicans to relent on contentious issues during the waning days of this legislative session. One simmering issue involves two bills that seek to fix a typo in rules that govern funding for Efficiency Maine, which is worth about $36 million for energy conservation programs. One bill, sponsored by Rep. Sara Gideon, D-Freeport, who is the assistant House majority leader, would fix the typo and do nothing else. That bill, LD 1215, was approved in the House on May 6 with a 138-1 vote but has yet to be brought up in the Senate. 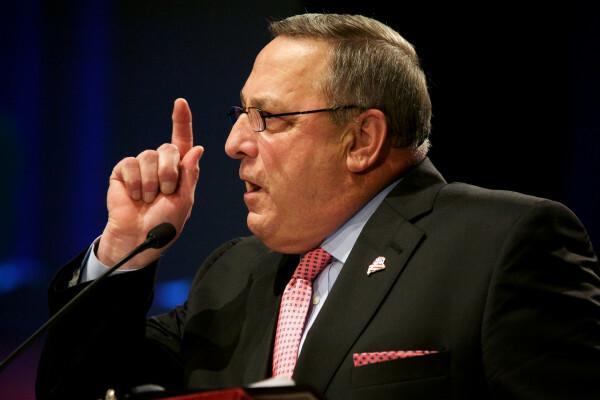 LePage has indicated in the past that he would veto Gideon’s bill. Meanwhile, a second bill to fix the typo, sponsored by House Minority Leader Ken Fredette, R-Newport, also seeks to create a state-level energy commissioner and increase the governor’s influence over Efficiency Maine. That bill, LD 1221, was tabled by the Energy Committee in late April and remains there. Fredette, who shared the microphone with LePage during Friday’s news conference, called on Democrats to move the energy commissioner portion of the bill forward. While Democrats have argued that LePage and Fredette are trying to play politics with energy efficiency programs by attaching the creation of new bureaucracy to the typo fix, Republicans say Democrats aren’t interested in creating stronger oversight of an agency responsible for tens of millions of taxpayer dollars. On Friday, an angry LePage repeatedly called Williamson a top-notch candidate that he fears will be driven away by political infighting. “This kind of stuff is not helpful to the people of Maine,” he said before lashing out at Energy Committee Chairman Mark Dion, D-Portland, for suggesting that there was a “crisis of confidence” surrounding the PUC. Dion said in a written statement that PUC commissioners serve six-year terms and are responsible for one of the most important policy areas in Maine.